The expansion of Russian Empire led to the expansion of slavery in acquired territories. For certain parts of the country there was however made an exception. For example, several Cossack regions in Southern Russia and the Ural Mountains developed as isolated enclaves of relative freedom. The first Cossack regions formed between the 14th and 18th centuries on lonely borderlands settled by runaway serfs, organized brigands and other warlike adventurers mainly from Russia and Ukraine. The first settlers calling themselves the Cossacks (a Turkish word meaning "the dare-devils") created a specific societies combining cult of violence and unrestricted freedom with elements of democracy and elementary law. Forming mobile rural communities the Cossacks earned their living mainly by making plundering raids on neighboring lands at that time belonging to Turkey and Iran. During those raids they often created families taking their future wives as a part of loot. After a number of unsuccessful attempts of turning Cossacks into serfs the rulers of growing Russia finally granted them a special status within Russian Empire. The Cossacks in turn were obliged to defend Russian frontiers from the neighboring countries. Later on when the frontier moved further South- and Eastwards the Cossacks were transformed into privileged militia serving as elite troops and high-professional gendarmerie. The communist revolution of 1917 and the civil war of 1918-22 brought dramatic changes to the Cossack regions. 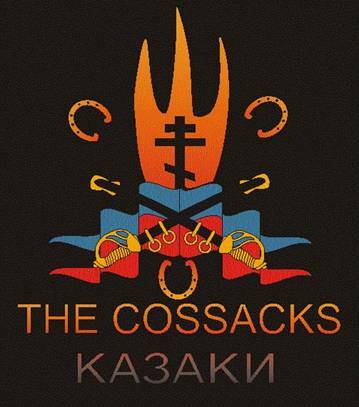 Seen as potential opposition by the new communist government of Russia, the Cossacks became one of the unwanted social groups. In early 1918 their traditional privileges and freedoms were taken away and their leaders were executed. 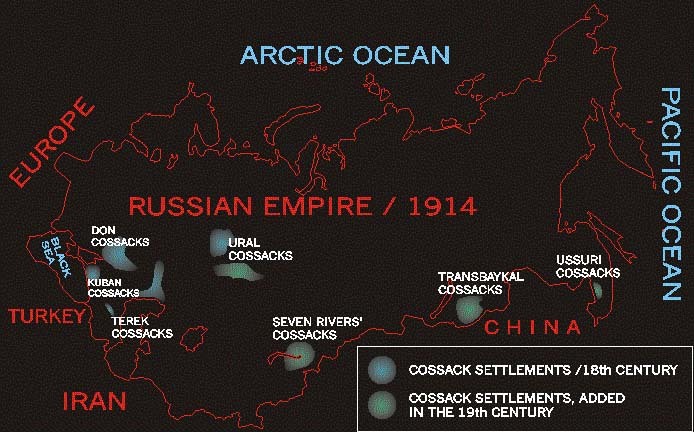 The severe repressions of the communist rulers of Russia led to the Cossack uprisings as well as the attempts to create separate Cossack states (especially in North Caucasus/Don area). However iteratively outnumbered by the Red Army and cut off the important strategic resources and foreign support, the Cossacks were unable to withstand the pressure of the rest of Russia and were finally defeated by the end of 1920. The “pacification” of the Cossack regions was accompanied by mass murder of civilian Cossack population. Hundreds thousands of men, women and children were wiped out by the Red Army and the CheKa. Tens thousands had to flee abroad forming Cossack colonies in France, Turkey, China, Argentine, Brazil, Uruguay and other countries. The remaining Cossack population was left to vegetate in the totalitarian communist state. During WW2 a considerable amount of Cossacks volunteered to serve in German Wehrmacht mistakenly believing that Hitler’s Germany was an alternative to the Soviet regime they hated. That was the last act of the Cossack tragedy. The Cossack troops of the Third Reich attempted an exodus retreating westwards together with their families. By the end of the war, most of them surrendered to the Allies hoping for mercy. They were not aware however of the Yalta Agreements under which the Western Allies to hand over to the USSR any Soviet collaborators who fell into their hands. The end of the Cossacks was bitter and heart-breaking. Their pleas for mercy fell on the deaf ears. So did the petitions organized by German POWs and Russian diasporas abroad. The British even extradited old Cossack Generals Krasnov, Schkuro and Kulakov who in fact never were Soviet citizens. 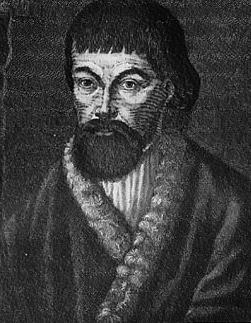 The above three were hanged together with German commander of all Cossack troops General von Pannwitz who had refused to leave his men in their hour of peril. Most of the Cossack officers were shot together with many of the soldiers and sergeants. Others were swallowed by the GULAG, from which few ever returned.